Many years ago, I gained popularity in the trading community when I began my newsletter called The Daily Directional Forecast (DDF) in 2001. This newsletter was unique in that for the first time in trading history, I called the next day direction of the market, in advance of the opening, with an incredible 80%+ accuracy. At that time, and continuing today, many so-called pundits said it was impossible to know where the market will be each day, but I was able to successfully prove that theory wrong for 14 years of publishing the DDF. The underlying theory of The Daily Directional Forecast was that the markets are rigged by special interests, including the Federal Reserve and the Central banks around the world. In addition to that you have what are called algorithm predators, and other big league operations, that manipulate the markets using sophisticated programs. At the peak of the newsletters popularity, we had over 6,000 subscribers and sold out live seminars in the US. At one seminar in Boca Raton, Florida we had over 320 traders attend and many of whom were floor traders from Chicago, brokers along with large 50-100 lot traders. During the period of 2001-2004, interest in the understanding of market rigging by the central banks was starting to cause a stir. I continued to describe to traders, very specifically, how one could see and indeed predict price movements based on knowledge and understanding of the rigging operations being conducted. During the period of 2004-2008 when market rigging got really entrenched I was focused on showing traders how they could be successful trading in spite of the rigging operations by training through my Mohan’s Precision Trading Services. In today’s modern trading environment you hear practically everyone talking about market manipulation and calling out the Federal Reserve for it. This includes big billion-dollar hedge fund managers, popular financial commentators and traders. It is now accepted as common knowledge, but where were all these commentators back in 2001-2003? I felt like a lone wolf, calling out the riggers publicly and took a lot of heat for it. Recently, the Commodity Futures Commission instigated Rule 565 which specifically punishes with fines those who break the rules set out to prevent price manipulation (known as spoofing), market rigging and algorithm predatory efforts. It is also stated in the rule to include, amazingly, even Central Banks. But has market rigging/manipulation stopped? Where are all the notices about violation of this Rule 565 with the violators exposed and fined? It’s rather hard to find any reports on this since this rule has been implemented. We all know how a city street looks different from these different altitudes- from standing right on the sidewalk to being above the city in a helicopter and flying into a city from a jet, perhaps coming back from a trip. The side walk view of the market bias is achieved by learning to read what I call -The High 5. This is the Down Jones Industrial average, the Nasdaq 100, the Transportation index and the Advance/Decline ratio. Learning how to read these and correlate them is the first step for US stock index futures traders. Without knowing the High 5, you are not truly looking at the market bias. Below is a screen shot of my High 5 shown along with the key futures contracts as well such as Crude Oil and Gold. I would like to show you a detailed Free Report on how to read and correlate the High 5 into your US stock index futures trading. It is called How To Read The Market Like A Book and can be seen on my blog site at www.daytradersaction.com. For day trading the stock indexes it is also important to understand the reading of the higher time-frame charts. I consider these to be the 5 minute chart, 13 minute, 30 minute, 60 and 135 minute chart. You must know what is going on with the higher time-frames while you are scalping or micro scalping the lower-time frames. It will help keep you on the right side by viewing things from a helicopter view. The airplane view of the markets is seen by understanding the Volume Weighting of Price levels, known as the VWOP, along with calculating the average volume ratios over a 4 day periods, put/call ratios and daily key, higher-moving averages. If all this sounds a bit complex it is at first, but with time and practice you can learn it. However, you can take the easier route and let me do all the work for you and give you my analysis while I make live mini Nasdaq futures trades in my Day Traders Action live trading room. Visit my blog at www.daytradersaction.com to learn more. It’s hard work in the room but we have a lot of fun too scalping away at the markets each day. Come join us and begin your advanced trading education. Odds are, you will learn more about the US stock market and futures indexes in 2 days in my room then you will in 2 years searching all over the web. If you have a deep thirst for trading and learning about the markets I invite you to explore my Mohan’s Precision Trading Services, including my well known Boomerang Day Trader software. Boomerang Day Trader is the first day-trading software in the history of the markets that Guarantees 90% winning trades following the simple method/rules that I teach for using the software. Our more than one thousand users tell me, daily in their emails, that trading has never been easier and more profitable. How can I simplify my trading? Is there a way to consolidate all of the markets information into an easy to read method where I can get steady, winning trades? I am proud to say that my Boomerang Day Trader software can help you there. Common sense tells us that the trading system should be simple to understand and use. Another pit fall of new traders is that they may become enamored by an overly fancy or complex trading system but in the live day trading environment the system may not be useful. I have heard this complaint a lot over my 16 years in the industry working with close to 50,000 traders through my live seminars/webinars, blogs, and live trading room. If you cannot execute the system relatively easily in the fast, live environment…..then what good is it really? Fancy technical looking indicators and highly intellectual sounding theory may seem like what you are looking for, however “when the rubber meets the road” (IE: when you start trading the system live with real money) you may become confused and not be able to manage the trades effectively. A relatively easy and simple system to execute whose signals and trade setups can be understood clearly in the fast market environment we see each day in futures trading. Verifiable, proven results that you can build on to make $150,000 or more a year (anything less seems like too little for the difficult and risky business of futures day trading). Please take a look at these 2 charts below. 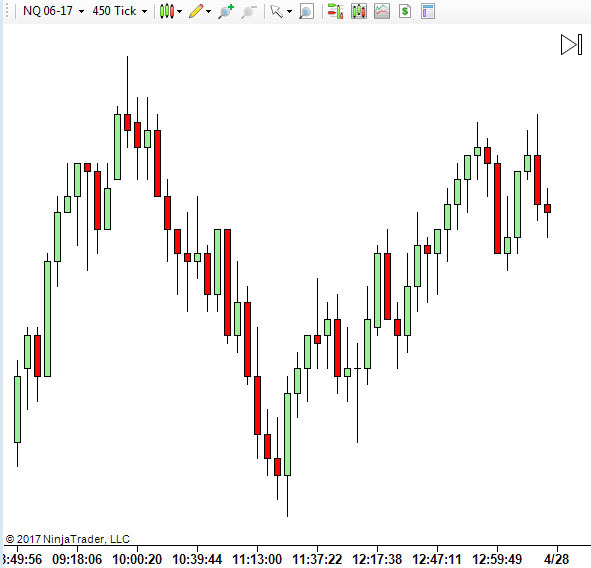 The top one is a plain mini Nasdaq (symbol: NQ) futures chart using a 450 tick setting. I am using the NinjaTrader software and powering the charts with eSignal data feed. Now take a look at my “Boomerang Day Trader “chart below for the exact same period in the markets. What a difference in clarity the Boomerang chart has compared to the first, plain chart shown above. Now for the best part… let’s do the math. * Following the simple Boomerang Day Trader method/rules there were 3 winning trades in a row during this period. * According to our systems crystal clear entry, stop and exit rules these 3 trades would have produced +9 NQ points. * Each point with 1 contract on the NQ is worth $20. Nine (9) NQ points therefore would be $180$ minus commission which on 1 contract X 3 trades would be about $20. Total would be around + $160 net gain. * On a small, what I call a “Blue Collar Working Traders” account ($5-8K trading 4 NQ contracts) this would have produced around $640 after commission. These 3 trades occurred in just a few hours of the trading day. On this given trading session there were 2 additional winning trade setups earlier with 100% winning trade setups creating close to an up to potential +$1000 day for a “Blue Collar Working Trader” account. * Now always remember that futures trading is very risky and only risk capital should be employed. Using the same chart above I have marked squares over the active area where the Boomerang trade setups occurred and I will explain the exact trade signals below. Trade setup #1 on the left side boxed area of the chart shows a Green Arrow which is the opening of the Trade Channel. On the 2nd candle tapped the Bollinger Band after the Trade Channel alert candle closed. The Bollinger Bands are the thin, white bands on the outside of the prices. 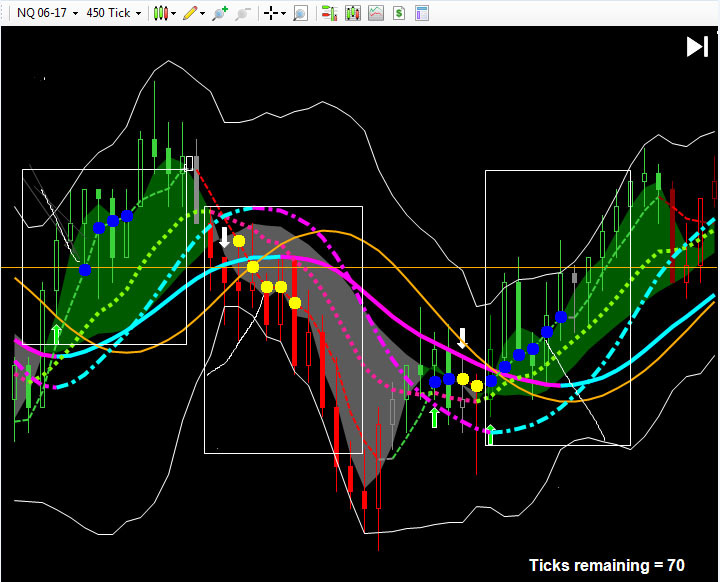 A tap on the Bollinger Band is required by the rules to confirm the trade. After the above setup occurs (notice: it is the same setup for each of the three trades shown) the Boomerang trade method is to take the next pullback to the Blue Dot (if a buy) and the Yellow dot (if a sell). 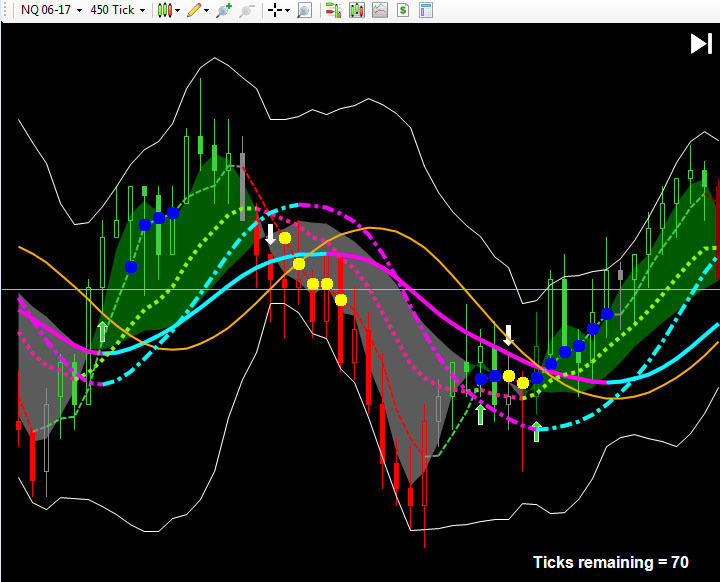 An automatic 5 point stop is placed and a 3 point gain with one click using NinjaTrader trade brackets. Each of the 3 trades followed this simple method and entry/stop rule and were successful trade setups for +3 NQ points each. Boomerang Day Trader continues to be an extremely popular day trading software after being available on the market for over 7 years. No other day trading software in the industry has ever Guaranteed 90% winning trade setups like Boomerang does. It is an industry first. There are close to 1000 + traders around the globe taking these and similar correct trade signals on Boomerang. You can access live webinars that I personally conduct on Boomerang showing the exact method/rules on hundreds of charts at www.boomerangtrader.com. After over 26 years of trading and making it somewhat of a hobby to read and study all the trading methods, books and other elements out there, I was not satisfied with what I saw. So I went to work over a 5 year period with the goal of making the easiest to understand, yet most profitable day trading software ever seen. It was a daunting task, but I finally released Boomerang Day Trader in 2009. In late the late part of 2014, after more research on the original version, I developed Ultra Boomerang Day Trader and it is amazing. 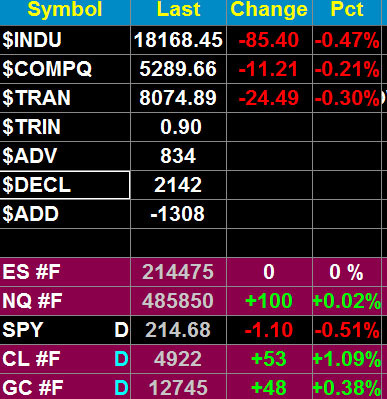 We are getting regular, steady 90%+ winning trade signals from the software on mini Nasdaq, Crude oil and others. Using our simple method and just 2 rules you can achieve a very high degree of winning day trades by aligning yourself with the software as thousands around the globe have done that. Crude Oil is particularly a smooth contract to trade with Boomerang and I invite you to watch the short video below where I review a recent 3 day period using Boomerang Day Trader on Crude oil. The software produced over 98% winning trade signals in an easy to trade method. www.boomerangtrader.com to see those videos. If you are currently in a losing cycle or a break even cycle and want to simplify your trading to make it more profitable I designed Boomerang Day Trader for you. Boomerang Day Trader is the only day-trading software in the history of the markets that Guarantees 90% winning trades, following our simple method/rules. It is only $1195 and comes with a lifetime license (used with NinjaTrader). Mohan is a 25 year trading veteran and trading coach for over 14 years in the industry. 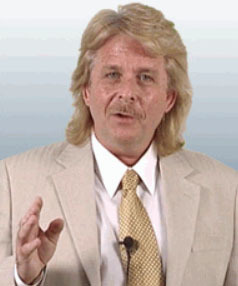 He is also the developer of Boomerang Day Trader, which is one of the top selling day trading software on NinjaTrader. Boomerang is also the first day trading software to offer a “90% guaranteed winning trade signals,” creating an historical precedent in the industry.